The general method is to create a binary code on the back of each wheel wedge using retro-reflective tape along with a corresponding photoelectric sensor for each binary digit required. For our install, we used 3M conspicuity tape, also known as retro-reflective tape, and three AutomationDirect DM series polarized reflective photoelectric sensors. One sensor for each binary digit, or band of tape. With three sensors we are able to have eight unique wedges of the wheel. Why eight? Well, the highest number we can achieve with 3 bits is 7 (0b111, or 2^2 + 2^1 + 2^0 = 7) and if we include 0 (0b000), then we can have a total of eight unique wedges. With this configuration, you can have as many wedges as you’d like as long as they fit on your wheel, but they must be a permutation of your eight unique ones. If you need more unique wedges, simply add an additional sensor and band of tape for each binary digit required. Four bands of tape will give you 16 unique wedges, five bands of tape will give you 32 unique wedges, and so on. 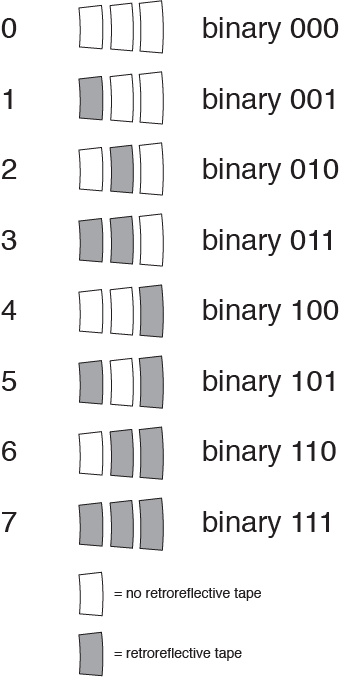 Below is an image describing how you would use retro-reflective tape to define a binary code for the photoelectric sensors to read. Note: It is very important to test your retro-reflective tape with your photoelectric sensors before any cutting or installing. Some tape reflects less light than others and will not work under less than ideal conditions! The brain of the carnival wheel was a BrightSign HD410 solid state media player. Each photoelectric sensor was wired to the GPIO control port of the BrightSign using a breakout board from HMS Electronics and a custom script was written to play a specific video depending on the output of each sensor. All in all, a clever way to track a traditional carnival wheel with all the image, music, and video capabilities of the robust BrightSign player!